For 50 years Mona Precast (Anglesey) Ltd have been producing the highest quality concrete blocks, bricks and paviours for the construction and domestic industry. Mona Precast are proud of their dedicated team. Many of their members have been employed for over twenty years and are a major factor in the success of the business and a tribute to the 50 successful years they are now celebrating. 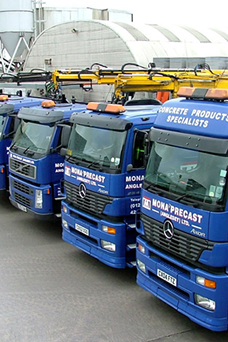 To maintain Customer Service at the highest level Mona Precast operates it’s very own dedicated transport fleet. Many landmarks across Wales and England are built with the best, building products made and supplied by Mona Precast.